Aerobics First is our premiere community running store. It is locally-owned, community driven, and is dedicated to both promoting active lifestyles and supporting active individuals through their own athletic challenges. I have a special affinity for the store because I ran with Matt Sheffield’s A1-based running club in 2010 and set personal bests at distances from 5k to 42.2k. It seems only natural that they be the road-running gear sponsors for my community driven running expedition, even though the community I am talking about is across the world in Africa. Part-owner Luke MacDonald agreed to meet with me to talk about my campaign and I was pleased. He agreed to meet with me at Harbour View Elementary School where he helps run an after-school Running & Reading program through KidsFest. Actually, he agreed to meet with me while the program was running… i.e. while I helped out with the program. What can I say, the man is wise! And it was fun! When is the last time you watched 10 year old kids run in circles, giggling wildly, waving their arms and stopping occasionally to jump up and down because it’s fun? It’s impossible to watch kids do this without feeling joy. My running expedition fit with Aerobics First’s community philosophy and I’m happy to welcome them as an in-kind sponsor. Although, little did I know that I could easily welcome Luke as my fundraising CEO. He knows everyone, he’s well connected, he’s energetic and he’s generous in spirit and is generous with his time. After meeting with him, my inbox began to fill and my phone began to ring. If you join my Love4Gambia Bluenose Marathon Charity Team, you’ll also have a chance to benefit from Aerobics First’s generosity. You’ll be eligible to win 1 of 5 pairs of Asics running shoes if you are one of the first 5 team members to raise $500 (team fundraising minimum = $100). This entry was posted in marathon training, running, Running Store and tagged Aerobics First, generosity, Luke MacDonald, sneakers, team. Bookmark the permalink. 1 Response to Aerobics First Joins Team! 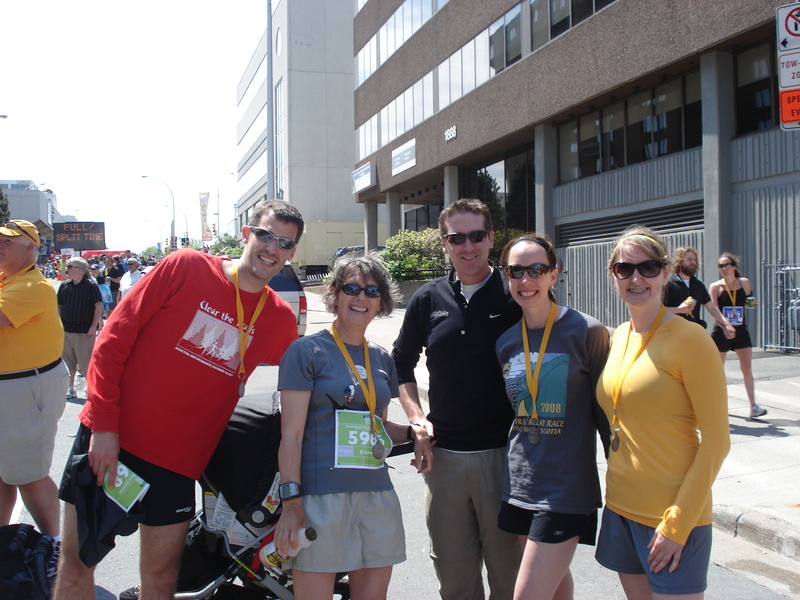 Congrats on snagging an awesome sponsor — every Halifax runner LOVES Aerobics First.